After the previous day's trip to North Sister, my toes were hurting badly from several miles of hiking in ski boots, so I knew the next day would have to be easy and relaxing with no more hiking. Mt Bachelor seemed like the perfect choice. You could drive to 6400 ft at Sunrise Lodge, and then skin up and ski down on continuous snow. It had been a month since the ski area had closed this year, but I remember only a few years ago when Bachelor would regularly run into mid-June, and even beyond. It's a shame that the current management refuses to extend the spring season for their customers, since the ski area could easily make it to July this year. Anyway, I guess it provides another very convenient option for earning your turns, and so that's what I did. 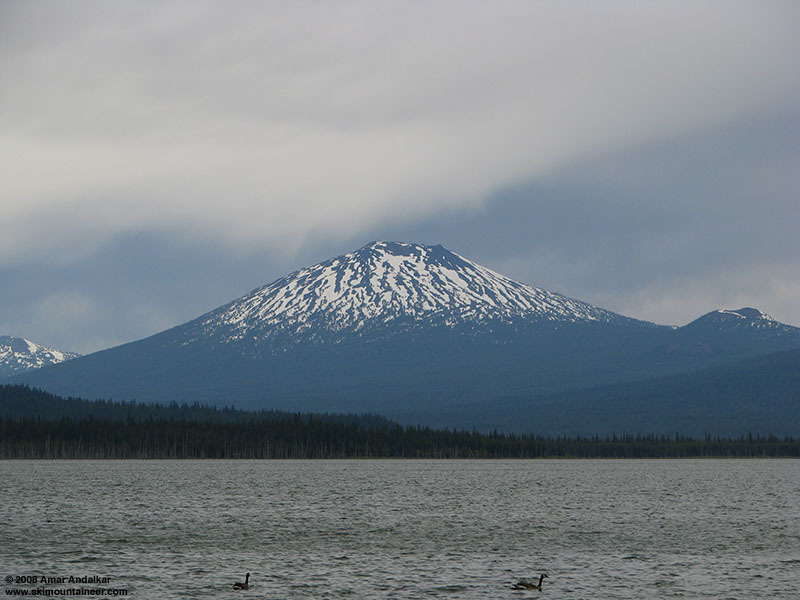 Mt Bachelor from the northeast, still looking very snowy for late June. As usual, another late start had me hiking across the Sunrise parking lot and skinning up the hill just after 11am. The tiny roadside area outside the locked gate was nearly full with 8 cars, it seems ski area management just doesn't want anyone to use their precious parking lot. A leisurely pace up well-consolidated snow on the NE side of the mountain got me to the top of Summit Express by 12:30pm, and then a long traverse west to the 9065 ft true summit just before 1pm. It was my first time up Mt Bachelor without using the lifts, it felt nice to finally have a "legitimate" ascent of this volcano under my belt. 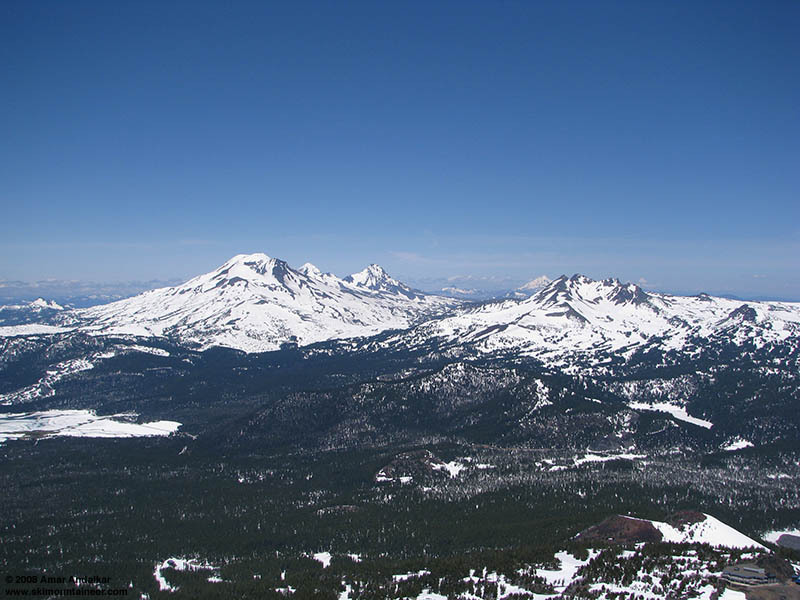 Looking north from the summit of Mt Bachelor, with the Three Sisters and Broken Top dominating the view, with Three Fingered Jack and Mt Jefferson in between them. It was sunny and beautiful again this day, but a brisk 20-30 mph southerly wind made it necessary to stay sheltered on the north side of some lava outcrops. I spent a while chatting with a guy from Colorado, who was doing his own volcano-hopping ski trip, and then decided to try something a bit more adventurous than just skiing straight back to the car. What about the south side? Would it still have enough snow? I had never skied down that side before, and I don't know if it was ever open during the numerous random days I've skied the ski area over the years. 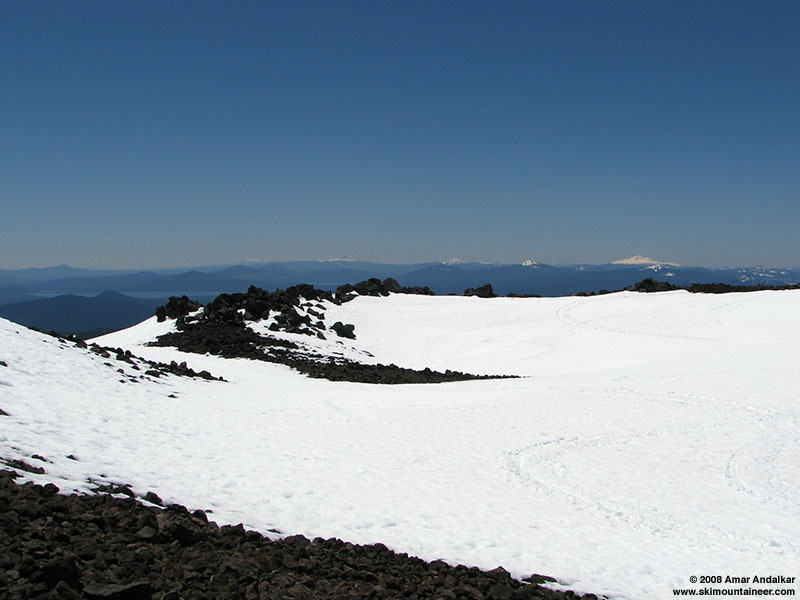 Looking south across the summit crater, with views of many distant volcanoes including snowcovered Mt Scott, Mt Thielsen, Mt Bailey, Maiden Peak, and Diamond Peak. I skied down from the top at 1:45pm, heading right around to the south through the summit crater and searching for an all-snow route. The first try was a dead end on a ridge of black lava, so I traversed farther right and tried another gap, only about 20 ft wide. This one went (but might not for much longer), and rolled over onto a nice 30-35 degree pitch which held really good corn! I was psyched, so much that I just kept skiing and skiing, down the slope and then some gullies and below treeline and down to about 6900 ft. This was down in solid forest, and it looked like the snow continued for hundreds of more vert, but the quality was only so-so down here, typical spring forest snow, semi-firm with a light scattering of conifer needles and forest debris. The south side of Mt Bachelor looks very thin compared to the north. View from Crane Prairie Reservoir, 5 days after this trip. So I skinned back up, it was blazing hot on the steep south-facing slopes and sun-concentrating gullies, but as I got higher up the breeze helped out a lot. Skinned to 8950 ft on the south side of the summit cone, and then decided to ski the NW face down to the top of Northwest Express, just for variety. I figured it would be softened just right at 3:30pm and it was, another run of very nice corn down a fine slope, followed by the long traverse on the Summit Crossover trail to the top of Sunrise Express. The last part down Rooster Tail to the base was occasionally sticky, but still not too bad. 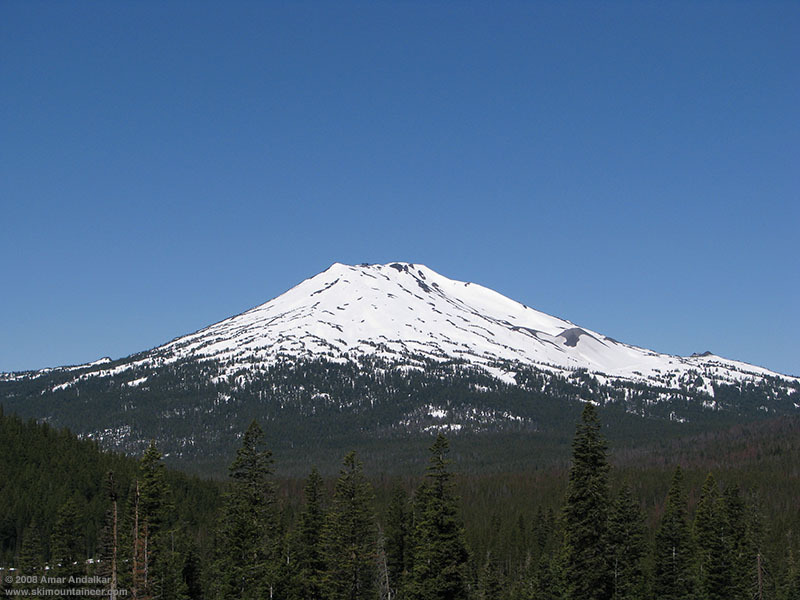 A nice restful day out, with about 4600 vert of ski ascent and descent plus some very nice views of the Three Sisters and Broken Top. Amar, what type of gasoline are you drinking? you're a machine! It's called stoked to be on a "permanently retired kick" gasoline!